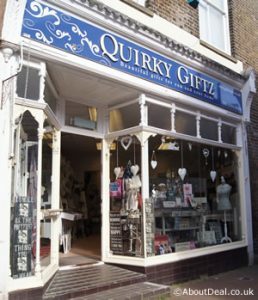 Quirky Giftz. 22 High Street, Deal, Kent, CT14 7AE. Vintage style photo frames, plaques & signs. Home accessories, wedding gifts, jewellery, accessories, etc. This entry was posted on Thursday, July 13th, 2017 at 1:14 pm	and is filed under Businesses, Gifts & Jewellery, Shops. You can leave a response, or trackback from your own site.